Aunty Helen became my babysitter when I was 7 months old. She is also a part of our family and eventually influenced the person that I grew into. Even though we moved a couple years ago to a different state, she still visits us every year, and this summer she went with us on a family trip to Sri Lanka. She is one of the most important people in my life as I regard her as my third parent, and she says that I am her one of her favorite grandsons. It is also because of her that I am affiliated with Buicks. When my parents first met her, she was driving a 1991 blue Buick Skylark. Then she graduated to a light brown 1997 Buick Skylark, then a 2003 Buick LeSabre Custom, and now a 2011 Buick LaCrosse. I remember the day that I got off the school bus, and Aunty Helen was waiting for me with a huge grin on her face. 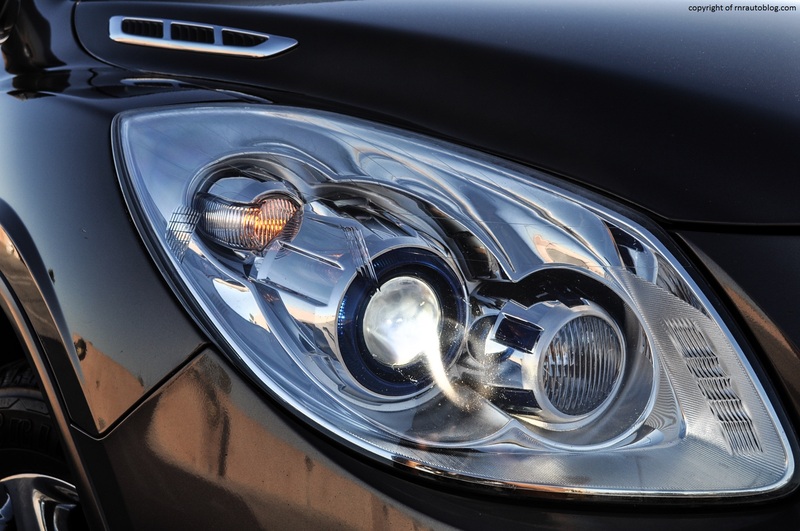 I asked her, “Aunty Helen, why are you so happy to see me?” She said, “Honey, I got a new car.” She motioned to a shiny and sparkling black Buick LeSabre parked on the street. Aunty Helen was beaming with pride, and my sister and I were amazed at how huge the car was. Even though the LeSabre is a bland and unexciting car, it will always be in my memories because that was Aunty Helen’s car. 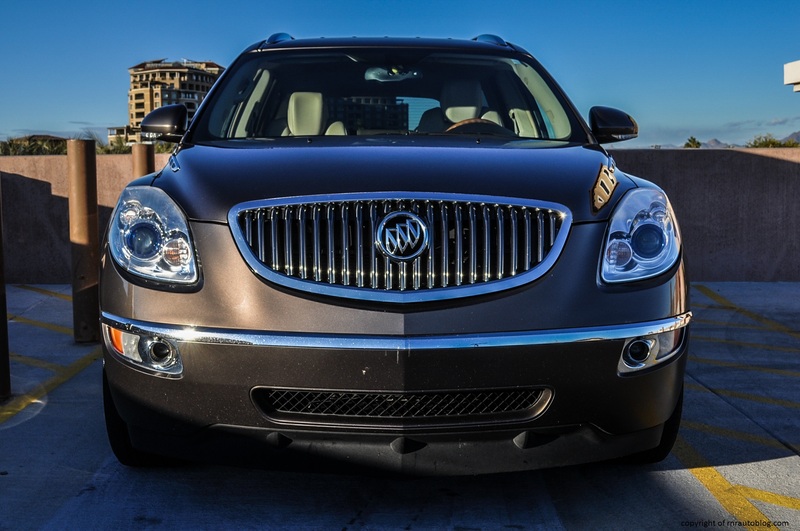 Replacing both the Rendezvous and the Rainer SUVs in 2008, the Enclave was Buick’s first attempt at redefining Buick as a brand. The Enclave is one of quadruplets, the other three being the Chevrolet Traverse, GMC Acadia, and the discontinued Saturn Outlook. These four SUVs are built on the Lambda chassis, GM’s platform for large crossovers with three rows of seating. 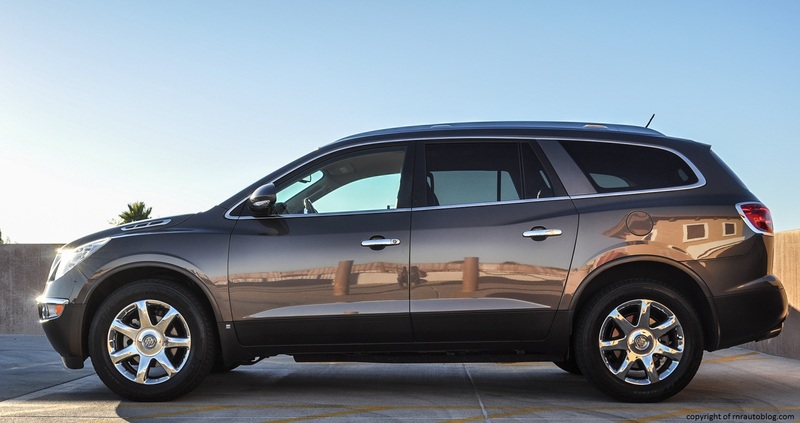 Even though I have reviewed a 2014 Chevrolet Traverse (The Buick, Chevrolet, and GMC were refreshed in 2012), I was curious to see what a Buick SUV would be like, given my personal history with the brand. 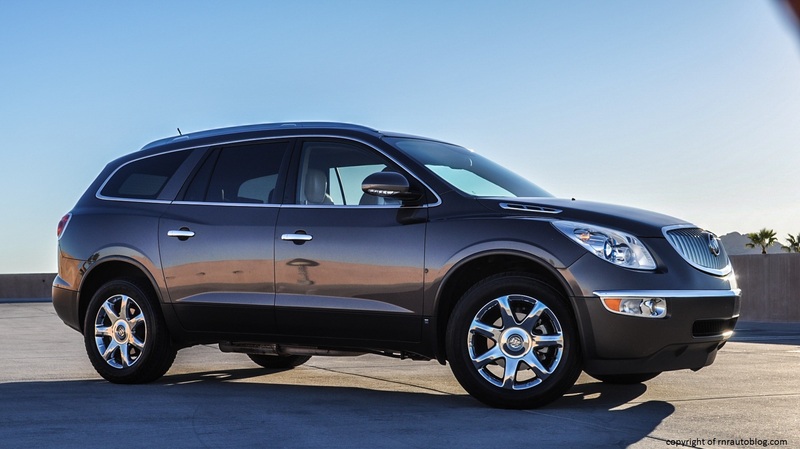 The Enclave looks suitably like a Buick, and Buick did a great job differentiating the Enclave from its GMC and Chevrolet siblings (as well as the defunct Saturn). Normally, I would deem this much use of chrome detailing excessive, but it actually suits the Buick. 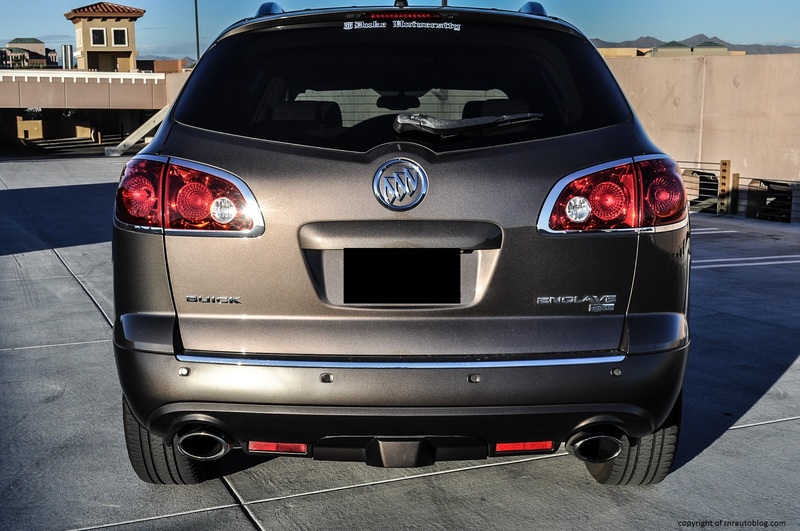 Typically, Buicks are conservatively styled cars, but they always have that one gaudy detail to distinguish them from their Chevrolet/Buick equivalents. 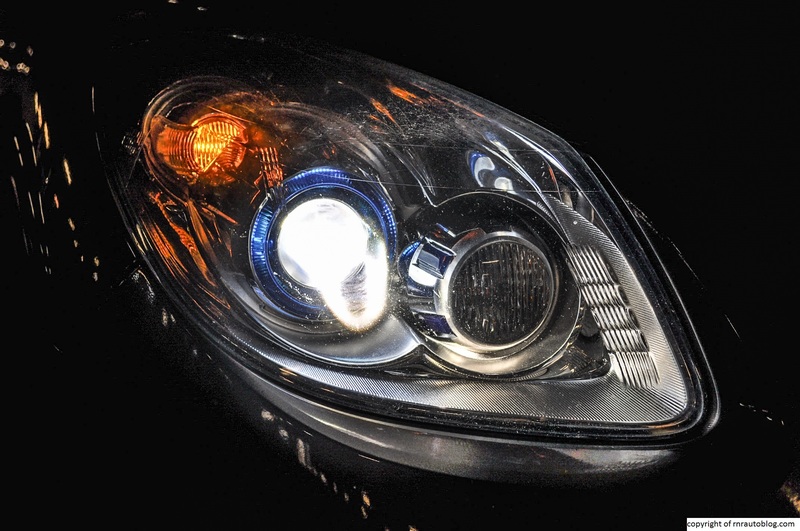 Up front, a tasteful grille and detailed headlights adorn the front. The height of the hood does give it a slightly brash stance. 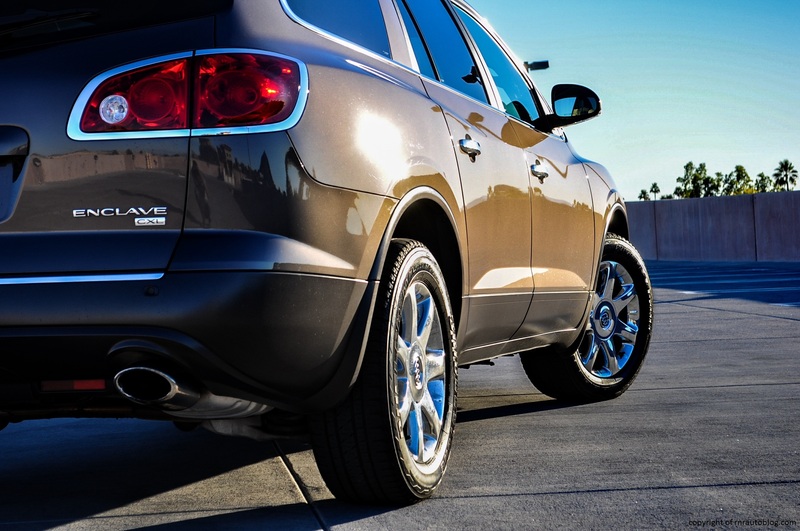 The side profile is where Enclave’s classification as a large SUV becomes apparent. It is really long. Just look at the length of the rear door. Other than that, it looks pretty standard. There is a character line that morphs to form a crease as it reaches the third row window. 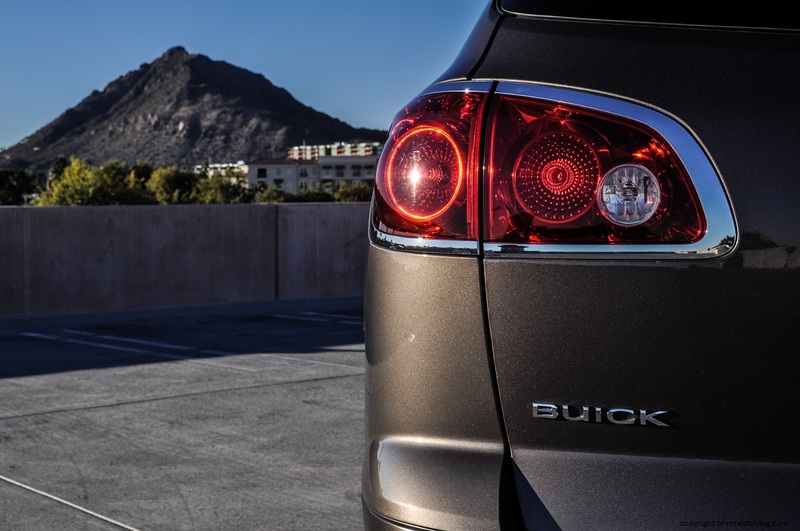 The rear is what you would expect of a Buick; inoffensive with a touch of gaudiness. For some reason, I actually like the chrome-lined tailights. 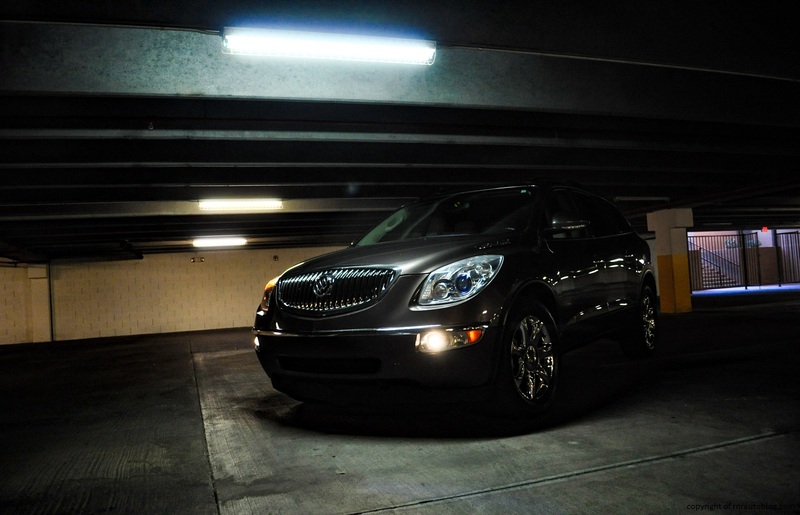 The Cocoa Metallic color suits the car as a Buick. 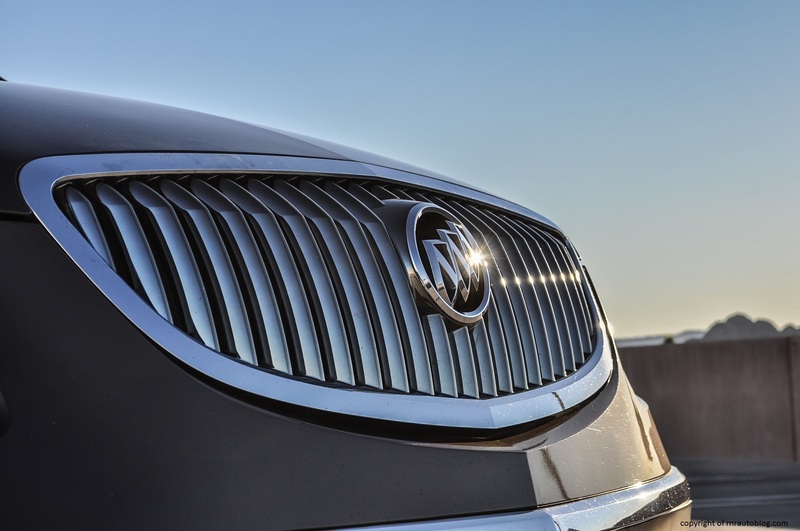 One detail that I do like are the “VentiPorts” , a traditional Buick styling element that consists of vents along the hood (for modern Buicks). The “VentiPorts” depict the number of cylinders on each side of the engine, since the Enclave has a V6, three vents on each side. The interior has a nice decor to it thanks to the wood trim and the use of bright colors. I especially like the teal colored gauges. As soon as I got in the driver’s seat, I looked at the rear, and I said to myself, “Dang. This is a huge car.” Fortunately, it drives smaller than its size would suggest. The steering responds promptly, and road textures are relayed through the steering. However, the steering’s weighting leaves much to be desired. The steering is very light at low speeds, which aids parking and such, and it firms up somewhat at speed. However, it is still too light for my taste, and it makes the car feel twitchy and nervous, especially at higher speeds. I understand that in an SUV as big as this, most consumers prefer to have light steering, but the steering’s nervousness is a letdown, and at mall parking lot speeds, the steering is slow to self center. There is lots of body lean, but it handles relatively well for its size. 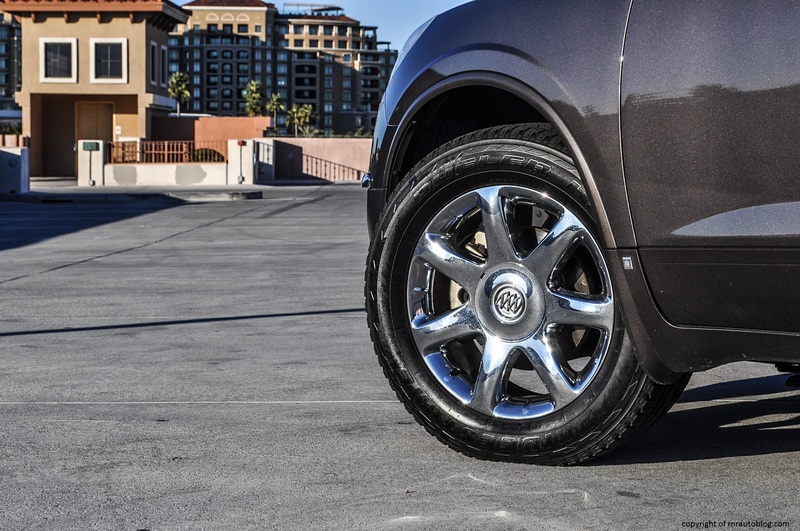 The body lean is due to the soft suspension, but mind you, it is not floaty as a typical Buick. Aunty Helen’s Buick LeSabre would bob up and down over undulating pavements, but thank goodness this Enclave does not do that. The suspension is soft, but it is also tied down, meaning that it suppresses bumps beautifully. Even the worst roads do little to upset the cabin. 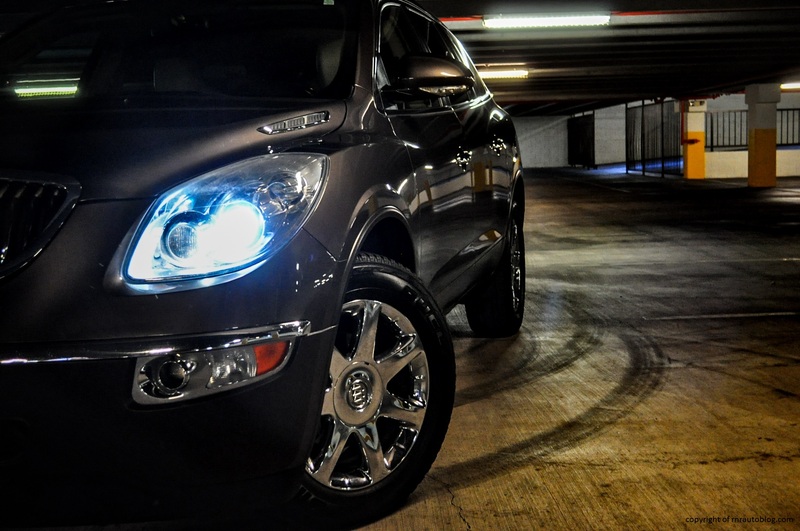 With a curb weight close to 5000 lbs, the Enclave is heavy. With a 3.6 liter V6 pumping just 275 horsepower, you would be forgiven for thinking that 275 is too measly for a vehicle as portly as this. On the contrary, the engine propels this hulk with surprising authority. It is not fast by any means, but it is adequate for daily driving. 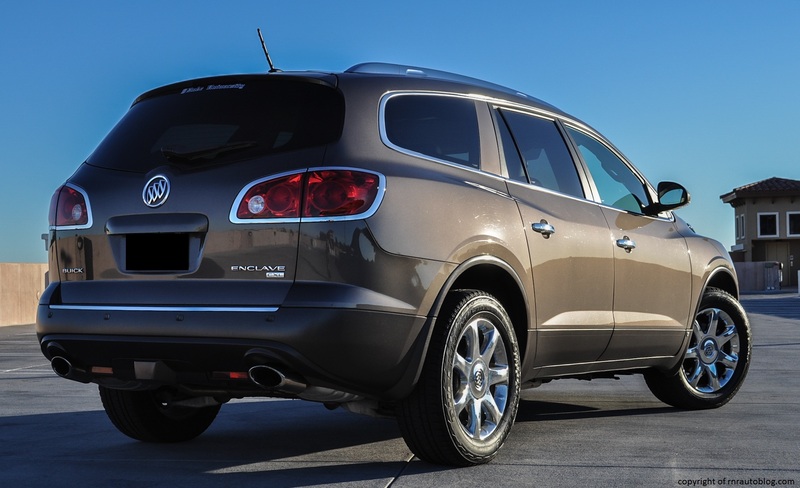 However, at low revs, it can feel burdened by the Enclave’s weight. In this front wheel drive version (the Enclave is available in both FWD and AWD), torque steer is evident under hard acceleration. The only transmission on offer is a six speed automatic transmission. The transmission is way too eager to shift down, so whenever I depress the pedal more, it immediately shifts to the lower gear. 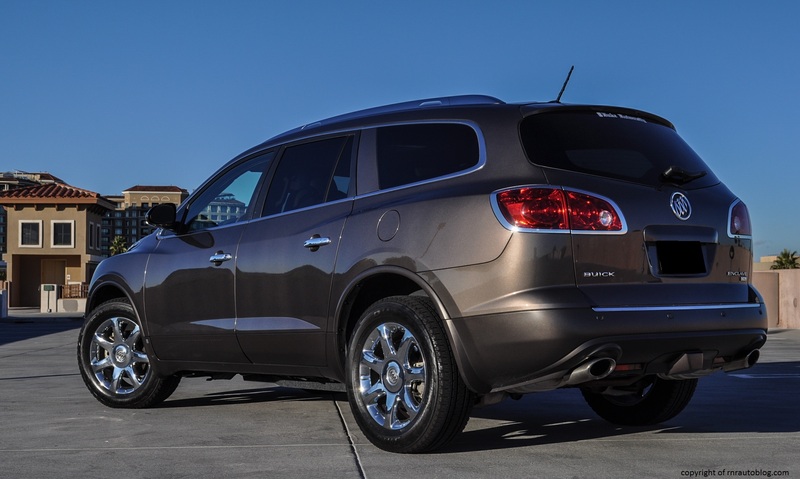 Weirdly, it is hesitant to upshift as well, making the Enclave feel slower than it needs to be. 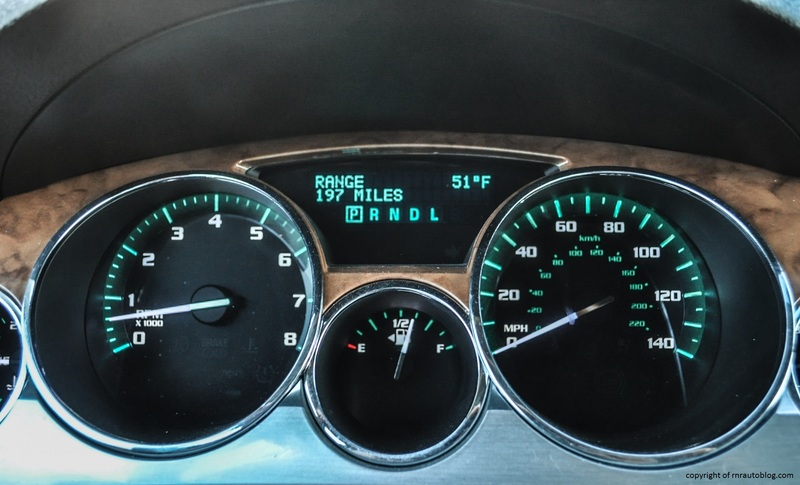 Fuel economy could be more competitive, as the official fuel economy ratings for the 2008 Enclave were 16 mpg for both FWD and AWD, and 22 and 24 mpg highway for FWD and AWD. In an SUV as upscale as this, I was surprised at the Enclave’s refinement. Refinement would be excellent except you always hear the engine groaning. When you floor it, the engine note becomes a combination of groans and whirs. As you cruise along, it literally sounds like the engine is in pain. Historically, General Motors’ vehicles were not always known for their high quality interiors. However, the company has made great strides recently. The interior feels, dare I say it, luxurious and well finished save for some flimsy materials. Despite its size, the large steering wheel feels great to hold, and the cabin is airy. I know I keep talking about how big this car is, but if you ever set foot in an Enclave or any of its stablemates, you will see what I mean. The interior is humongous, and there is plentiful legroom and headroom in both the first and second rows. The third row is not as roomy as the second row, but it is actually comfortable enough for three adults, a rarity in an SUV. 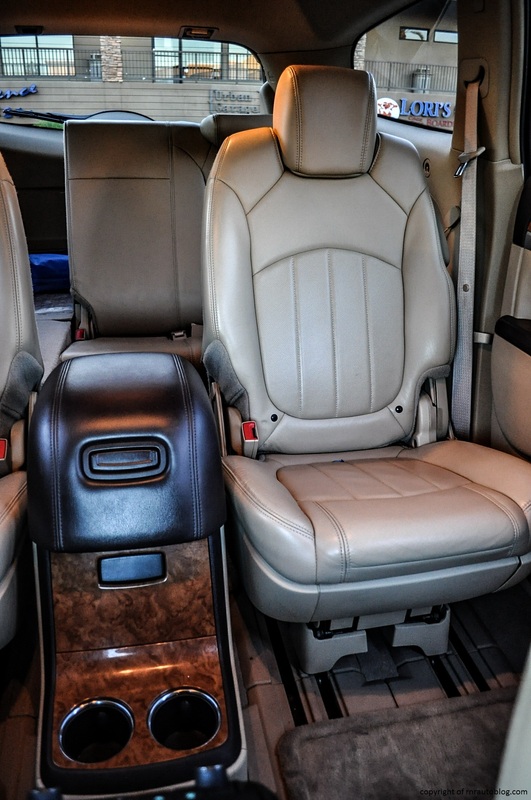 The cargo area is cavernous as well even more so with the seats down, and the second row seats slide with ease. Visibility is not that great, with big pillars obstructing your rear view. Thankfully the door mirrors are large. Finding a driving position is easy, although when I tried to sit up higher, the steering column was too low for me, even after adjusting it. However, you have a commanding view of the road. I literally sit up as high in the Enclave as people in most SUVs and trucks! The optional captian chairs reduce this Enclave’s seating to seven instead of eight which is I would go for the standard second row bench instead despite the usable center console that the captain chairs bring. 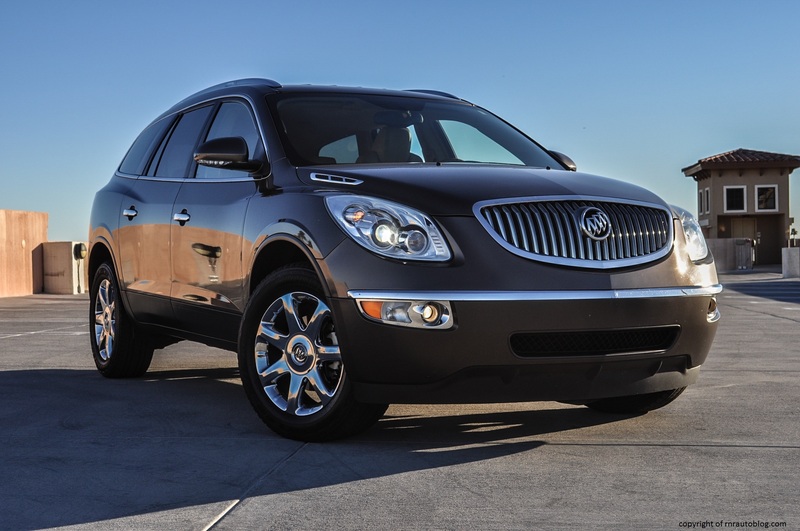 This CXL version (the 2o08 Enclave was sold in CX and CXL versions, with the latter being the more expensive and better equipped version) comes cushy and comfortable leather seats. I wish there was better cabin storage as the center console in the front is very shallow, and there are not that many cubbies. 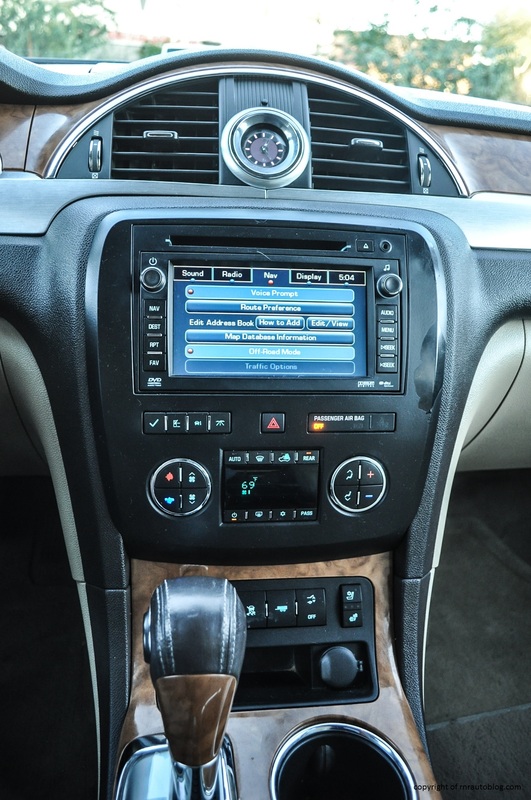 Access is commendable, and the controls and gauges are easy to comprehend. 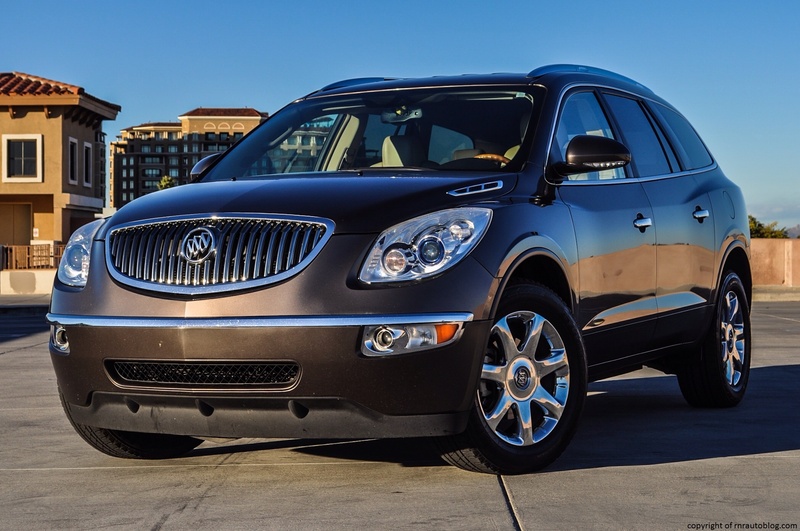 For many years, Buicks have been ostracized for being known as the car for the elderly. 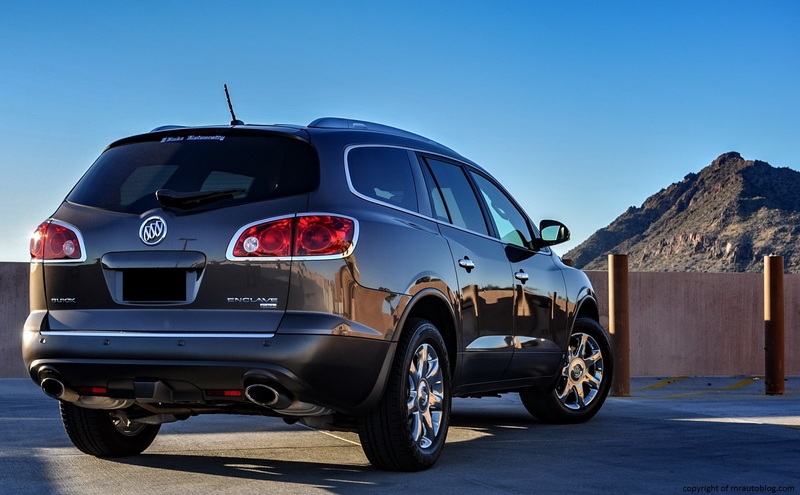 Even though Buick is vastly different compared to ten years ago (for starters, in 2015, two vehicles in Buick’s lineup can be had with a manual transmission), people still cling on to the stereotype associated with Buicks. I am a huge fan of the 2011-present Buick Regal, and no joke, but I would buy that if I were in the market for an upscale sedan. With a manual transmission of course. I told my friend Miranda this, and her response? “A Buick???? ?” (This was during texting hence the number of question marks.) 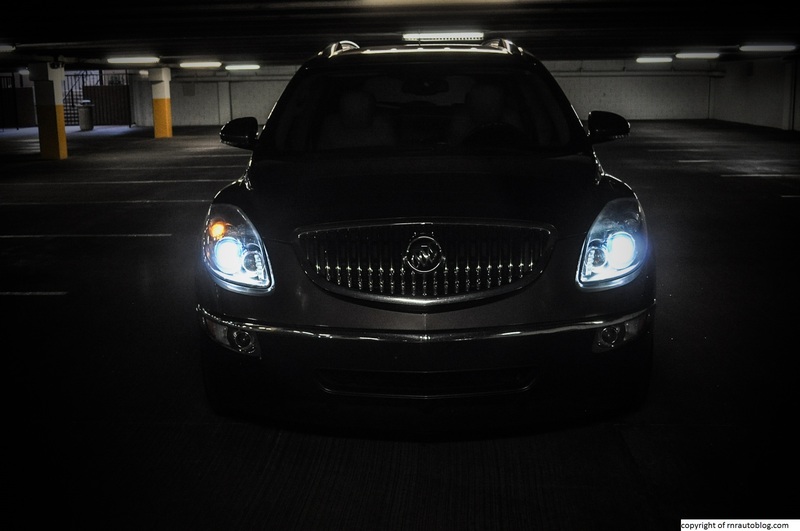 My point being is that the Enclave is not the stodgy and boring Buick that we remember. 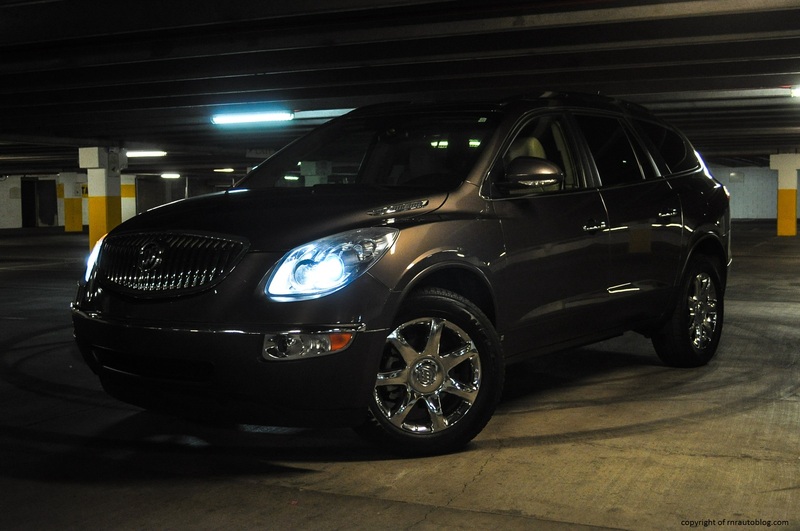 It looks good, and it is styled like a proper Buick, and the Cocoa Metallic color is gorgeous. The interior is huge, but it drives well considering its size, and there is that argument for buying American. Long story short, I wouldn’t buy this because if I wanted a big vehicle to house my entire family, I would just get a minivan. 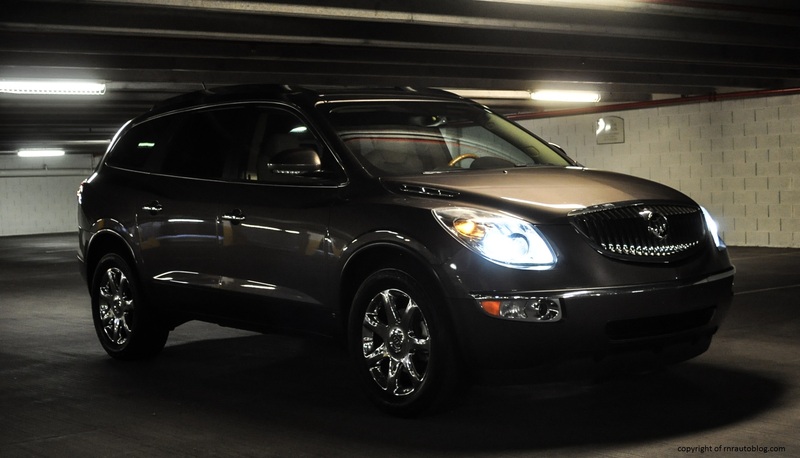 But for anyone in the market for a large SUV with comfort and a semblance of luxury, the Enclave is hard to beat.